Soak Imli for 2 hours in water. Then boil it and save the juice. In juice add salt, black and red peper, sugar and grind it. After that cook it on medium heat for 4-5 minutes. Remove from heat and set it aside. In besan add baking powder, salt and mix well . After that deep fry it. Now soak them in hot water (hot water with pinch of salt) for 1-2 minutes and then squeeze them to drain all water out. Put them in a plate. You can make some bondis with the rest of the besan. In yogurt mix salt and red chiili powder, potato, onion, tomato, green chiilies. 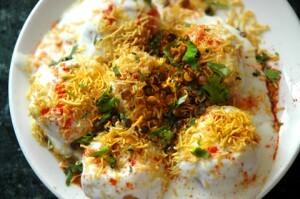 Then add bhalay after that chat masala, bhail(bondi) and chutney. Have a Un forgetable taste. ENJOY!!! !